In the 1740’s the British were doing all they could to disrupt the alliance between the French and their First Nation allies. In the spring of 1745 a group of the French’s Wyandotte allies returned to Detroit from visiting Chouaquin or Fort Oswego. They reported to the French that many of their allies attended a council where the British told them that they should consider them the only source of trade because the British navy was going to put to sea to take Canada and become the absolute masters in North America. Therefore, trade goods would be scarce or unavailable at the French trading posts. This news produced so much consternation among the villages around Detroit that native traders would leave for British trading posts without saying a word. This of course was contrary to the wishes of the governor of New France. The French tried to rally their allies to attack the British and several parties of Ottawa and Saulteaux struck out for the Carolinas that summer but it was a half-hearted effort and they returned without striking a blow. Meanwhile goods did become very scarce at the French posts. This drove the prices up and lowered the value of pelts considerably. French traders needed a licence to trade, which they normally purchased but these economic conditions forced the commandants at the various trading posts to provide trading licences for free. All this made trading with the British all the more attractive. So much so that many were ignoring the direct orders of the governor not to trade with them. The Wyandotte war chief Nicholas moved his followers to Sandusky on the south side of Lake Erie. That spring some of his young warriors killed five Frenchmen and stole their furs. They were returning from the French post on the White River, a tributary of the Wabash. The news was brought to Chevalier de Longueuil, the commandant of Detroit by a Wyandotte woman whose loyalties were still attached to the French. She also informed him that all the neighboring nations had formed a plan to annihilate all the French of Detroit on one of the holidays of Pentecost, but the brash young warriors had struck too soon. Nicholas decided to press on with the plan to destroy Detroit. He attacked and destroyed the mission and villages on Bois Blanc Island in the Detroit River and the Black Robes fled to the safety of the fort. The commandant called a council of the First Nations that were allied to the French at Detroit. The Ottawa professed their loyalty as did Sasteradzy, the principal chief of the Detroit Wyandotte. The Wyandotte chief Taychatin confirmed his allegiance as well. They all claimed to have had no involvement in the treachery committed by Nicholas’ people that spring. The following spring Nicholas burned his village on the Sandusky River and moved his band to the White River in Indiana. That autumn while visiting the Iroquois he died in an outbreak at Kuskusky. Kuskusky was a First Nation town in the Beaver River Valley near the present-day New Castle, Pennsylvania. Of course the French blamed the English accusing them of sending secret belts to all the nations in the territory encouraging them to attack and destroy the French. They were probably right. Although in 1747 their allies confirmed their loyalties the future would bring even more turmoil for the French. NEXT WEEK: More of France’s Allies Revolt! 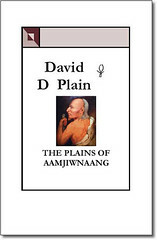 You are currently browsing the Books by David D Plain Blog blog archives for August, 2010.